A stupendous number of induction motors are being used in the industry. The induction motor is truly the workhorse of the modern age. Even though the speed control of induction motor is not simple and efficient, the reason for the motor's popularity is its ruggedness and simplicity. However, with the introduction of power electronic controllers, the case of speed/torque control of the induction motor is now comparable with that of the d.c. motor. Induction motors come in a wide range of ratings, from fractional horsepower motors used in tools and domestic appliances to motors of megawatt rating used for boiler feed pump in thermal power stations. A broad classification is presented in Table 1. It is not possible to make any general statements about the protection of induction motor, since the protection scheme depends on the size (horsepower/kW rating) of the motor and its importance in the system. This is the reason why induction motor protection has not been standardized to the extent that other protection schemes have been. However, regardless of what protection we may provide, all motors, big or small, are subjected to similar faults and abnormal operating conditions. The induction motor can not be considered in isolation. On the one side, it is connected to the supply, possibly through some kind of power electronic controller and on the other side, it is mechanically coupled to the load. Therefore, the induction motor is subjected to a large number of faults and abnormal operating conditions as depicted in Fig.1. Fig.1 Operating abnormal conditions and faults experienced on induction motors. An induction motor draws a very large starting current, of the order of 6 to 8 times the full-load current if started direct-on-line. The amplitude of the starting current may be comparable to fault current. Therefore, the over-current protection provided to the motor must be able to discriminate between a genuine fault and an over-current due to starting of the motor. 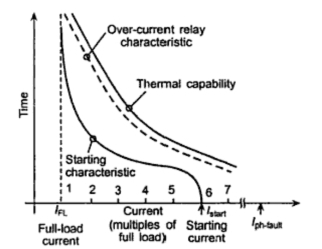 Hence, coordination between the starting characteristic of the motor and the over-current relay is required Figure 2 shows the starting current superimposed on the thermal capability curve of the motor, and the characteristic of an over-current relay, which might be used for protection of the motor. It can be seen from Figure 2 that the OC relay characteristic must be above the starting characteristics but below the thermal characteristics of the motor. This will ensure that the protective relay does not operate during starting phase the motor but will positively operate when the load exceeds the motor's thermal capability.